This matters not because now you’ll always know which way is North with the iPhone, or even because you can make a quick-and-dirty metal detector with it. It matters because it finally opens up the iPhone to real augmented reality. In that august position, it joins the ranks of a handful of other smartphones, including (in particular) the Android G1 and the Nokia N97. 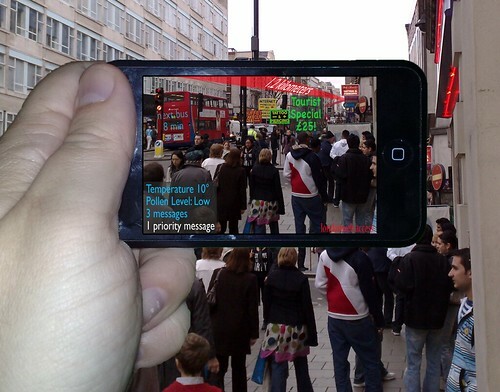 Augmented reality (AR) technologies offer the ability to layer data–including images–over our perceptions of the physical world. While science fiction versions of AR usually involves high-tech eyewear, real-world AR is moving swiftly from the labs to the users via advanced smartphones. These handhelds offer everything a basic AR setup needs: a good display; a camera to see the world; and location-awareness. That last one is important, and the compass/magnetometer in new iPhone 3G S will finally bring the Apple line up to snuff. Now the handheld can know which direction it’s being pointed–and when combined with location information through A-GPS, the iPhone will (with the right software) be able to recognize what it’s looking at, adding tags, notes, and directions as necessary. For a glimpse of what that would mean, readers with G1s should check out the SkyMap app, available for free from the Android Market. SkyMap provides a real-time map of constellations and planets, showing you the relevant names and information when pointed at the sky. You can even tell it to search for a celestial body, and it will point you toward where Mars (for example) is at this moment. Casual astronomy buffs no doubt get a kick out of this app, but think about where this is heading. How long until there’s a StarbucksMap app, something that will know where you are and be able to point you to the nearest coffee shop? (Which, admittedly, is probably within a few hundred meters from wherever you are.) Any of the various location applications that have heretofore relied on giving you an overhead view of a map with some relevant thumbtack icons can now offer you “first person shooter” directions. Imagine the potential for social networking, even dating, apps. And imagine the games that are possible with this technology. That’s actually been something of a sad surprise for me, as a G1 user: the potential for immersive, AR-style games is so great, but there’s been little activity on that front. I hope that the new iPhone will push this field forward. But here’s the fun bit of speculation: imagine how this changes behavior. We already have problems with people walking around looking down at their phones, usually texting. If you’re using your smartphone as an AR device, however, you’re likely to be holding it up in front of you. While walking around. Less likely to run into walls or out into traffic, sure–but taking up a bit more personal space, and much more likely to drop the phone while being jostled in crowds. Might be time to start up an iPhone leash business.